Three years ago, driven by childhood memories of sweet, juicy tomatoes and a desire for organic vegetables, Eid began a search for seeds. He didn’t want just any seeds and he definitely did not want the seeds available on the market, expensive ones sold by multinational companies. So he started asking around, inquiring with Bedouin in Sinai to see if anyone had seeds saved from their past crops. Eid had no difficulty collecting melon, wheat, and barley seeds that have been growing in Sinai for years, but he could not find anyone who had tomato or cucumber seeds. Determined to find a source of seeds for the plants that once grew in Sinai, Eid set out on a mission. With his knowledge of the geography of Sinai, he began searching for the old campsites, where 40 – 50 years ago, Bedouin would spend the winter months. Eid confirmed that the campsites were old and often-used by looking at the fire pits. By digging beneath the sand, he determined which pits had deep layers of sand melted by the fires. The more layers, the older and more-used the fire was. Eid believed that these traditional campsites would have the seeds he was looking for because families would have left or thrown out seeds as they cooked their daily meals, leaving the area scattered with dried seeds. He decided he would irrigate a few of these places and see what would happen. In one of his chosen areas, Haduda, he regularly watered a patch of earth and waited patiently for something to grow. And something did – a few tomato plants have sprouted, flowered, and even fruited! Eid believes these are not your average tomato plants for the fruits do not look like any of the other tomatoes being grown locally. He believes this is the same variety of tomatoes that may have grown in Sinai years ago. Eid is determined to research this further, wanting to know exactly what type of tomato he is growing. 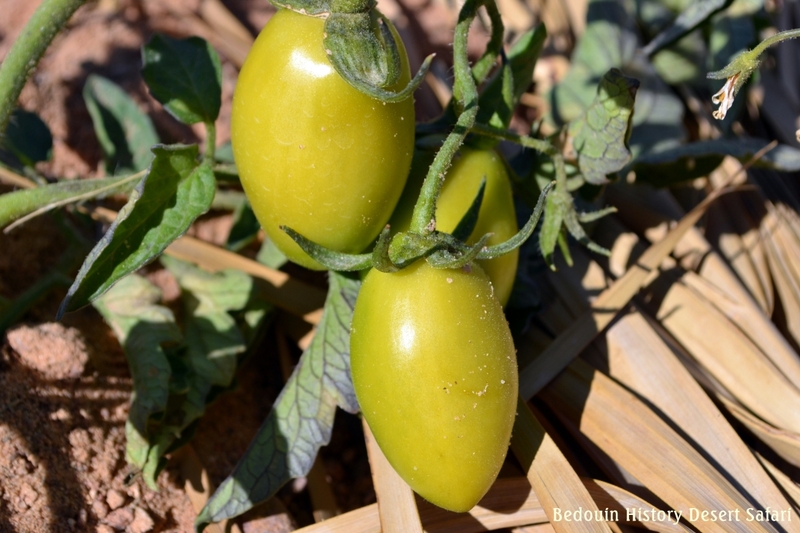 His greatest desire is to have local seeds that have not been tampered with genetically or chemically so that the Bedouin can cultivate local organic vegetables. For now, he awaits the ripening of his tomatoes.